Longtime readers know that we've spent almost twenty years trying to help people get started in garden railroading without having to take out a second mortgage on their houses. That effort has included a number of articles about acquiring, adapting, or creating buildings or at least parts of buildings, inexpensively. True, many of those articles depend on access to resources that are not available to everybody. But I hope we stimulate some "out of the box" thinking that helps you find creative, inexpensive solutions to your railroading needs. We have some other interesting projects in the works, so stay tuned. Trashbashing 101 - the original 2005 article on creating garden railroad structures from toys and other non-model sources. 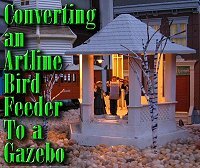 Converting an Artline Bird Feeder into a Gazebo - a 2018 follow-up article featuring a bird feeder you can still get from stores. Trashbashing Step By Step - a 2012 detailed account of multiple storefronts that were trashbashed simultaneously, with plenty of photos. Printed Buildings for Outdoor Railroads. - Using Plexiglass, labels, and concrete blocks to create suprisingly effective outdoor buildings. Temporary Building Fronts from Recycled Plastic - Using our graphic resources, weatherproof labels, and recycled plastic signs to make building fronts that you can use to jump-start your communities, or set up in public places, or leave out all winter in place of more expensive structures. Note: this article has been updated for 2013 with new tips and new graphics. 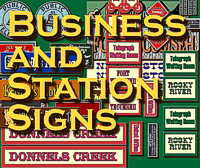 Business and Station Signs - Free downloadable graphics to add signage, realism, and "period" to your buildings. 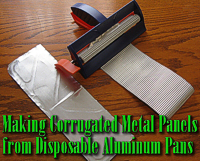 Making Corrugated Metal Panels from Disposable Aluminum Pans. This also works with aluminum cans and similar materials. Includes links to related external articles. 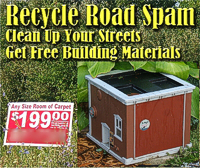 Recycle Road Spam - Repurposing the material from those fluted plastic signs that out-of-town scammers use to illegally trash your neighborhood. Hey - it's a public service! Plus the stuff holds up. Cheap Mullions (Windowframes) - using grocery-store berry baskets, plastic plant trays from the plant nurseries, hardware cloth, and other materials to provide windowframes for your scratchbuilt, kitbuilt, or trashbashed buildings. Free Project Wire from Bad Light Strands - "Cannabalizing" bad Christmas light strands to get wire for your building lighting. Almost Free Building Lighting - If you can track down 12volt replacement Christmas strand bulbs, you can combine those with sockets from a recycled Christmas light strand to light your buildings for a few cents each. For folks who would rather not trashbash or do everything from scratch, we're also keeping our eye out for building kits that don't cost more than the average television set. As a rule, buildings that cost half or less the cost of the expensive kits are just a bit more trouble to put together. But if you follow our instructions, the end result may be just as impressive. And no matter how you do the math, a town with 5 well-painted buildings is more impressive than a town with two. 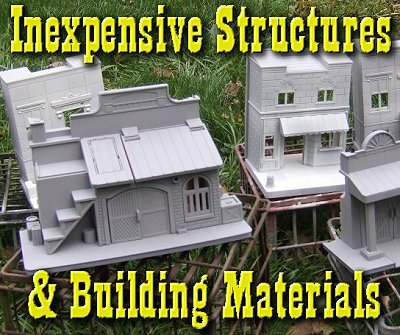 Colorado Model Structures's building kits. True, you can't snap their kits together and set them out like the "other guy's" kits. And they don't come with window glazing, (not even the stuff the other guys include that turns yellow and crystalizes). But I recommend custom painting and lucite glazing no matter what kind of kit you buy anyway. Also, they don't come with graphics (stickers), but we're improving our collection of downloadable graphics all the time, so that's not the issue you might think. So for responsible kit-assemblers, the only REAL difference is that they're a bit harder to glue together. Oh, and, depending on the kind of buildings you want, they cost from half to a quarter of the equivalent name-brand buildings. Here's the part where I keep my fingers crossed. No, we're not in any danger of putting Pola or Piko out of business singlehandedly. But "behind the scenes," we've been testing other ways to help you put buildings on your railroad without taking too much money out of the bank. So far, we have not had the success rate we'd like before we go public with the new things we're trying out. With any luck, we'll have something to publish soon. So stay tuned. We're on YOUR side, after all. Please let me know if you have any feedback, and enjoy your hobbies. Especially enjoy any time you can spend with your family in the coming months! See you online or in the back yard! To read more, or to look at recommended Garden Railroading and Display Railroad products, you may use the search button below or click on the index underneath it. Note: Family Garden Trains?, Garden Train Store?, Big Christmas Trains?, BIG Indoor Trains?, and BIG Train Store? are trademarks of Breakthrough Communications (www.btcomm.com). All information, data, text, and illustrations on this web site are Copyright (c) 1999, 2000, 2001, 2002, 2003, 2004, 2005, 2006, 2007, 2008, 2009, 2010, 2011, 2012, 2013 by Paul D. Race.